Anna and Maila (and Ben the dog) take Ruby and I for a walk. Because it’s bin day, and because Anna hardly ever uses one, I leave the pushchair at the office and we take the babies in carriers. Anna is testing the new back pack carrier that she’ll use for the slow marathon on Saturday. Anna takes me on the walk that she used to do everyday when she lived in Huntly, out towards Battlehill along the railway line, past the ruined farm, and back. 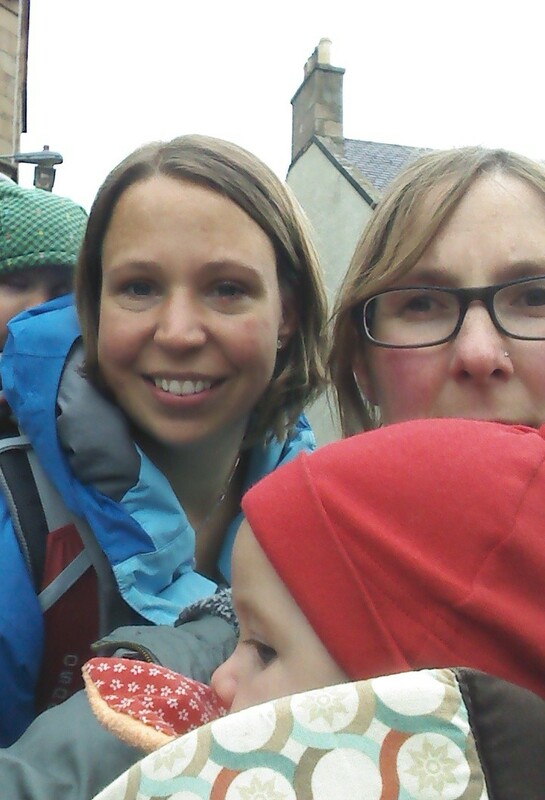 As we walk we talk about prams and pushchairs, wheel size and push-ability; about fitness and recovery after giving birth; about labour and walking (Anna walked up the hill that she lives at the base of, Tap o’ Noth in Rhynie, during the early stages of her labour). We talk about living in the countryside, and living in the city, and how different it is to walk in them respectively. Anna tells me about how getting a dog was a commitment to walking, daily walking, no matter the weather you have to go out with a dog. We talk about the slow marathon, and I remember Kaspar and Susanna (Treacle Theatre) who carried their 11 month old daughter across Belgium for 30 days taking part in the Sideways festival of walking in 2012. And they made an art project while they walked….. We talk about running with a pram, running on the road, about people stopping to offer a lift. We talk about folding a baby into your life, doing all of the things that you used to do with them; about baby activities and ‘groups’; about ‘proper’ music, rather than nursery rhymes. We talk about different types of baby carrier, stretchy and non-stretchy wraps, structured carriers and backpacks, wearing the babies whilst feeding, and cooking, and doing other things around the house. The babies both sleep while we walk. We talk about hypno-birthing, yoga and meditation; being prepared for birth, but not so prepared for having a baby. We talk about working, and whether it’s possible (or how it might be possible) to have a baby around at work. We talk about the landscape, Anna talks about how she feels it is being imprinted on Maila, that this beautiful place is present as her brain forms the key connections in her first year of life.